What an ugly feeling this brings up: My horse has thrush. It smells bad, it looks debilitating, after a while your horse even may become lame. Unappetizing, greasy substances in the creases of the frog often lead the horse owner to suspect thrush. Frequently, this diagnosis will be confirmed by a vet or farrier on the basis of this symptom. On closer investigation, however, it turns out that only a small percentage of the hooves with damp frog sulci actually have thrush. If the decomposition grease smells musty-rotten, a high sensitivity in the frog region is also noticeable, even lameness, then we are dealing with thrush. In most hoof textbooks poor hoof care and insufficient stable hygiene are usually cited as causes of thrush. Frequently the blame will also be given to incessant wetness or dampness. However, many years of studying hooves and investigating successful treatments of thrush have brought to light another picture of the cause of this disease. Moisture, at any rate, is not responsible (think of the Camarque horses, which live for weeks in flooded pastures and retain healthy hooves). Poor hoof care can only partly be identified as a cause (for example, with horses kept standing most of the time, unable to move freely), for who looks after the hooves of the wild, large breeding herds? The cause of thrush, as with most other hoof problems, lies in reduced circulation and thus restricte blood supply to the hoof. Even in the old books on hoofcare, thrush was depicted as a contracted hoof. In a contracted hoof, the lateral walls are parallel to one another, i.e. they do not diverge ground ward, as would be the case in a healthy hoof. When a healthy hoof becomes contracted, the sheets of sole horn are compressed laterally, at the expense of the frog, which is pinched. 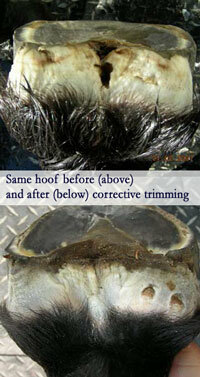 A cross-section through a healthy and a contracted hoof show the changes inside the hoof. The horn pressure against the transition between sole and frog corium (where, in the area of the heel, the bars are formed) flattens the corium and so impedes circulation in the region of the frog sulci. Too little oxygen and nutrient rich blood reaches the frog corium, and too little horn is produced in relation to the constant decomposition of the soft horn by bacteria. The frog becomes weaker and weaker. With dehydration of the hoof, cracks appear in the thin sheet of soft horn, possibly in as far as the corium, which then become infected. Wound discharge is a slightly alkaline environment and further helps the putrefactive agents. Because of the poor blood supply, the corium cannot heal. The frog region is sensitive to pressure to the point of lameness. The situation cannot, of course, be improved by drying and immobilization (stall rest), but rather only by the removal of the cause, i.e. the contraction of the hooves.